We know you’ve seen it all when it comes to Christmas fundraising ideas for schools, churches, synagogues, clubs or community groups. Home come the catalogs with the same old sales items like wrapping paper, flavored popcorn, holiday-themed trinkets, Christmas cards, etc. Pretty generic, and meaningless to family and friends who feel they have to buy something. But what if your students could present their parents, grandparents, aunts, uncles, and friends with a catalog filled with calendars, coffee mugs, mouse pads, photo frames, t-shirts, book bags and more, adorned with original artwork created by the student? Now THAT would be different, and hard to turn down! View our top Christmas gift products! Original works offers over 30 keepsake products, that are perfect for Christmas presents. Parents, and grandparent will cherish the gift with their child’s artwork for many years. That’s how irresistible Original Works’ holiday and Christmas fundraising programs can be for your school. Your students create a piece of art (it can be holiday themed). Your teachers package the art in our return packets. The artwork can be placed on the aforementioned magnets, mouse pads, etc. and your students’ family members choose to place the artwork on the item of their choice via a catalog or they can also view different items online. The family members order the items (all orders are submitted at the same time) and your school receives 33 percent of the proceeds. 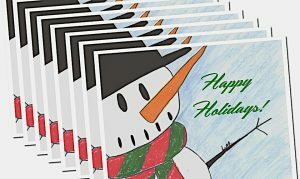 Your students’ works of art make great Christmas gifts for family members while the fundraiser becomes a great gift to your school. Contact Original Works at 800-421-0020 or send us a message.